Charlotte Speech and Hearing Center is a non-profit practice that provides a wide variety of clinical services for children and select services for adults. We’re proud to have a team of talented and dedicated therapists with a wide variety of skill sets that can meet your family’s needs. Our clinical services are family-centered and offer clients a highly individualized and holistic approach that ensures the best experience and outcome. 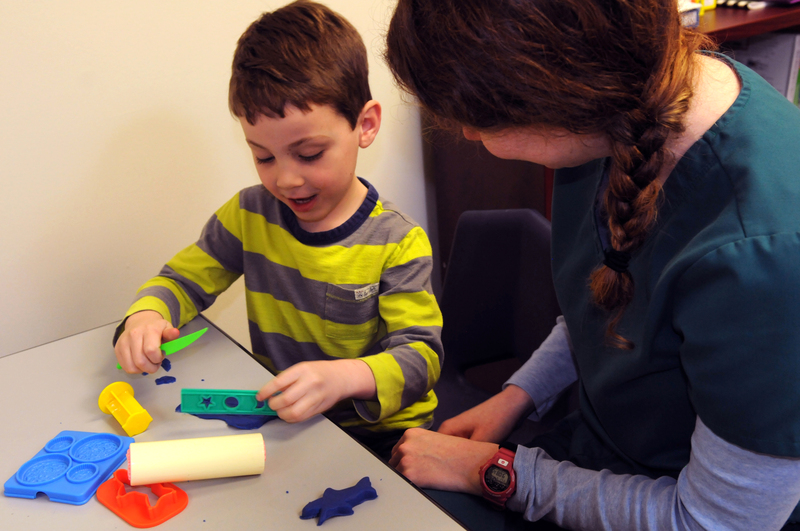 Our observation rooms (Charlotte clinic) offer parents the opportunity to see their child’s progress first-hand, as well as the opportunity to learn strategies and techniques to help their child master new skills at an advanced rate. Services can be provided in our Charlotte or Monroe clinics, and in some cases, in a home or childcare setting. We accept a wide variety of insurances and offer an assistance fund for those who qualify if cost is a concern. See below for a list of clinical services we provide. The therapist did a great job with my son. He has made great progress and always looked forward to his time with her. She provided strategies I could use at home and offered recommendations for retaining skills after his program ended. A screening is a brief look at the child’s speech, language, or hearing skills and is followed by a parent consultation. This is not a diagnosis of a deficit, but is a tool used to determine if further testing is necessary. The procedure usually takes about 30 minutes. Screenings are offered at no cost for children over the age of 2 years at our clinic, simply call 704-523-8027 to make an appointment. An evaluation is an in-depth analysis of communication skills. The goal of an evaluation is to determine if a deficit is present, and if there is, identify the type and severity of the deficit as well as provide a prognosis and recommendations for treatment. A complete case history is gathered and an evaluation of sound production, receptive and expressive language, fluency, voice and oral motor skills is completed. Therapy sessions for children are typically offered twice per week, for 30-minutes per session. You may enroll in therapy once you have received a diagnosis here or from another facility and your insurance benefits or payment options have been determined. The therapist will review the evaluation and diagnosis and work with you to determine goals that are appropriate for you/your child. It may take a few sessions before the therapist can estimate how long therapy will last. We also offer summer-only therapy for children who receive I.E.P. services during the school year to help them maintain and advance their speech-language skills in preparation for the coming year. Additionally, Charlotte Speech and Hearing Center offers Teletherapy services- speech-language therapy delivered through telecommunications technology (i.e. video and voice calls) for clients anywhere in North Carolina. Click here for more information on our Speech-language Services and our evaluation process. As a long-standing, non-profit practice we also offer community-based services across Mecklenburg and Union Counties that include early identification services, language and literacy programs, caregiver training, charter school services, our Yoga-language program, and more.